Habit: Biennial, perennial herb, rhizomed or tap- or tuberous-rooted, glabrous or minutely scabrous. Stem: generally spreading to erect. Leaf: blade oblong-ovate to obovate, entire to ternately, palmately, or pinnately lobed, dissected, or compound. Inflorescence: heads simple, in cymes or racemes, dense, of bisexual and staminate (staminate only) flowers; bracts entire or lobed, < to > heads; bisexual flowers pedicelled or not, staminate generally long-pedicelled. Flower: calyx lobes prominent, persistent, occasionally fused; petals wide, yellow, purple, or +- white (pale red-orange), tips narrowed, generally lobed; styles long or short; ovary tip projection 0. Fruit: oblong-ovate to round, +- compressed side-to-side; fruit-halves +- cylindric, prickly to scaly or tubercled; ribs 0; oil tubes evident or obscure, regularly or irregularly arranged; fruit central axis not obvious. Seed: face flat or grooved. Habit: Plant 8--40 cm, taprooted. 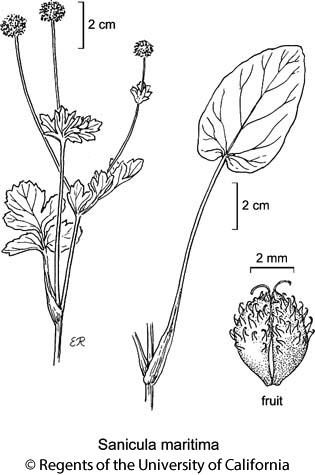 Leaf: simple, entire to +- pinnately lobed or dissected, green at flower; blade 3--8 cm, ovate-cordate to obovate, lobes or segments 0, 3, or 5, obtuse, entire to +- toothed. Inflorescence: peduncle 1.5--12 cm; bracts +- 10, 1--4 mm, < heads, lanceolate, acute; pedicel of bisexual flower 0, staminate 2.5--3 mm. Flower: bisexual 3--8, staminate 10--12; calyx lobes fused at base, 1.5--2 mm, lance-ovate, obtuse; corolla yellow; styles 3 × calyx lobes. Fruit: +- 5 mm, obovate; prickles stout, curved, inflated, bulbous-based distally, +- 0 proximally. Seed: face concave. Chromosomes: 2n=16. Citation for this treatment: Lincoln Constance & Margriet Wetherwax 2012, Sanicula maritima, in Jepson Flora Project (eds.) Jepson eFlora, http://ucjeps.berkeley.edu/eflora/eflora_display.php?tid=43177, accessed on April 23, 2019. CCo (Monterey, San Luis Obispo cos.), SnFrB (apparently extirpated). Markers link to CCH specimen records. Yellow markers indicate records that may provide evidence for eFlora range revision or may have georeferencing or identification issues. Purple markers indicate specimens collected from a garden, greenhouse, or other non-wild location.